Seasonal Whale Watching and Year-Round Dolphin Spotting. 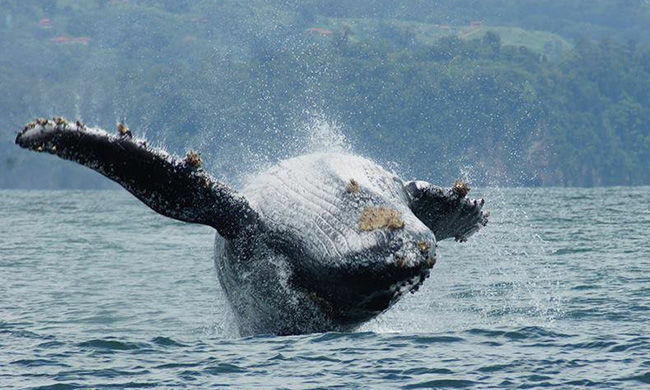 Ballena National Marine Park is home to one of the longest humpback whale seasons in the world! These warm and crystalline Pacific waters are popular among humpback, pseudo-orca, and pilot whales, as well as three species of dolphin. Choose between morning or afternoon to take a scenic boat ride as you keep an eye out for one of the estimated 25 whale and dolphin species that call Costa Rica their home. Perhaps you’ll be fortunate enough to spot a mother and calf, a pod of dolphins, or even a 40-ton splash. This tour is perfect for families, as well as individuals who enjoy nature and the water. Both whale watching and snorkeling are seasonal, with whale migrations from December to April and July to October, and snorkeling offered only during the dry months. Dolphin encounters are year-round. The places visited on the tour are subject to change due to weather conditions. The boat travels parallel to marine animals and at a maximum speed of 7 km/hour so as not to disturb them. Depending on the conditions at sea, you’ll visit the iconic Punta Uvita Whale Tail, Ballena Island, Tres Hermanas islets, and Ventana sea cave to take in the scenic beauty of the coastline as you maximize your chances to see these gentle giants. Weather permitting, you might also go through the caverns of Ventanas Beach. Keep your eyes open for brown boobies, pelicans, and even the endangered Hawkbill turtle. You’ll also have the opportunity to snorkel around coral and rock reefs during dry season. Your tour includes: boat transportation, captain, bilingual guide, snorkel equipment (during dry season), park entrance fees, fruit, water. Be at the dock 30 minutes prior to scheduled departure! What to bring: camera, sunscreen, insect repellent, sunglasses, hat, towel, poncho in rainy season. Wear a swimsuit, shoes with grip (for boat), shirt to cover shoulders while snorkeling. *If staying in Manuel Antonio area, ask for additional quote on ground transportation.